In the wake of Hurricane Sandy my mind frayed. I feel blessed that we were spared the devastation of losing a home. But my heart broke for those on the Jersey Shore, in Queens, Staten Island, and other areas, that lost everything. The media reportage was overwhelming and numbing. It was impossible to comprehend the havoc that had taken place in so short a time. Surreal. Social media communities galvanized – Facebook pleas abound. Those who are able, do. Still, there is nothing – no amount of philanthropy or planning – that can allay the catastrophe. In twenty years, coastal regions will be redrawn. The change will be imperceptible to us. I am consumed by the constant and imperceptible shifts that occur in what is often perceived as periods of stasis. It is as though we must step far, far, away from our daily lives in order to see – with any objectivity – what is happening around us. Great artists do this unintentionally. They mobilize the insecurity and flux of their generation and render it transparent. We can step back, look at their work and say, “Ah ha” I get it. Adversity often helps bring into focus perceptions that one might overlook. I wanted to view images that were not coming from a television. I wandered over to MoMA – I say wandered because I was trying to reconcile the devastation that I was seeing on the news, with the semblance of normalcy in midtown Manhattan. 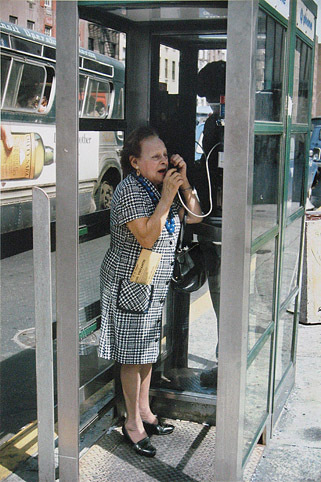 As fate would have it, MoMA is featuring an exhibit of Helen Levitt’s color photography in a small slide show. Levitt’s work is actually an ancillary exhibit presented with “New Photography 2012”. The artists — Michele Abeles, Birdhead, Anne Collier, Zoe Crosher, and Shirana Shahbazi — collectively, appear in the “New Photography” exhibit. 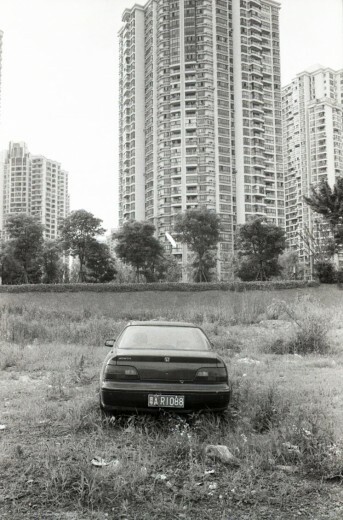 Taken out of context, the images in New Photography 2012 lack resonance. In Abeles’s work, we identify recurrent motifs but they relay no substantive information. Her manipulation of space is intriguing, but not cathartic. The curator’s text panel states, “Abeles’s props are familiar and generic, even bland, with minimal symbolic or narrative associations.” I would have to agree. I recalled Rauschenberg and his oeuvre of images culled from a plethora of discarded items. The result unveiled our cultures’ penchant for constant consumption. It also exposed our reckless abandonment of items that we become tired of. Discarded Nabisco crates displayed as a wall installation drove home a fact about our culture– that we covet and discard almost simultaneously. In Rauschenberg’s larger canvases, newsprint, everyday items, the fruits of mechanization, and iconic images are layered and meshed so that everything appears to be fading – transitory. Photographs of people from leading magazines of the time appear as silhouettes – ghosts in fractured landscapes. The effect lays bare a culture obsessed with the fabrication of things – items we are not able to live without: bridges, newspapers, telephones and gas stations. The paradox of needing so much and yet having nothing no matter how much one accumulates is echoed in works that appear stranded between Abstract Expression and Pop Art. While viewing “New Photography 2012” at MoMA, I am still seeing Hurricane Sandy’s effects and repercussions in my mind’s eye. My mind is unable to reconcile the catastrophic events with the disconnected images in this exhibit. I scrutinize the remainder of the work. “Birdhead”, the team of Ji Weiyu and Song Tao, come closest to revealing the socio-economic locus of an urban environment – Shanghai. Their experience of the city is fluid and captures the intense juxtaposition of disintegration and invention. Interestingly, they use only analog cameras. Zoe Crosher’s images require vast contextual information. This is not to say that they aren’t intriguing – they are. “The Michelle duBois Project”, is an amalgamation of self-portraits taken by sometimes call girl/flight attendant, Michelle duBois. She is evidently a real person who used a number of aliases. The resulting trajectory resembles a television movie of the week. We are not certain who occupies the frame or why and it does lead one to wonder why the artist seized upon these photos and opted to utilize them in recurrent shows. One could possibility realize a nod to the artifice of a digital age where so much information is dispensed about people that it is impossible to really know who they are, philosophically and literally. 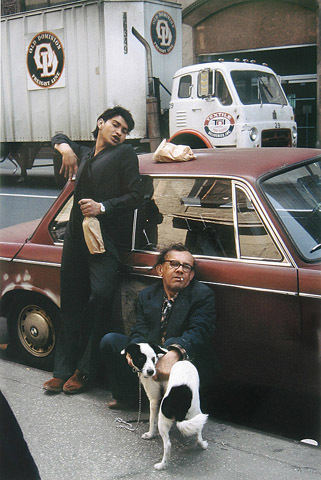 In Interview Magazine, Maxwell Williams wrote, “Confusion has followed the project everywhere since the inception.” Crosher maintains that it doesn’t matter who is in the photograph. She sees it as a chronicle of identities. As a viewer, I need more information in order to understand how this relates to what I see around me. Moving to an adjacent gallery, I immediately recognize the images projected on the white walls. 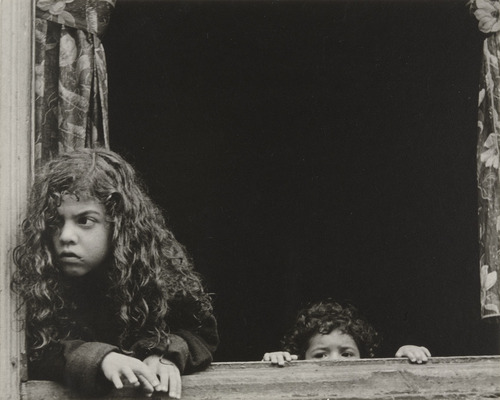 Helen Levitt’s work is singular and trenchant. Levitt recognized the transitory “decisive moment” – the instant that can never be recaptured once lost. The muse reveals the idiosyncratic and mysterious tenets of a civilization in flux to very few and Levitt had full access to this mystery. The photographs in the slide show date from 1974 and document the poorer parts of New York, Spanish Harlem and the Lower East Side. The capricious, seething, swirl of life was given fluency by Levitt’s seasoned eye. The narrative of a women standing in a phone booth in mid-conversation tickles our imagination. Is she in the midst of a plea or dispensing pertinent information? Possibly, she is telling her bookie what horse she wants in the third. Levitt possessed a pitch perfect street credo – she understood the transformative power of moments. Her work positions us as voyeurs, privy to neighborhoods and cultures that we otherwise would not know of. Her art is pure theatre and for seven or eight minutes I am transported. I can only see and imagine the people in Levitt’s photographs being projected on the wall. The slide show is seductive and visitors watch the same forty images over and over. But it is not just the slide show that galvanizes the audience – it is the content. It is Levitt’s ability to capture pathos and the incessant rhythm of uncertainty. As a result, we see a narrative spanning time and space. We make the connection and the resonance of her insight seals our comprehension. Flux is a constant – it is the people that make the inclement change prolific. The “Ah ha” moment is found here, in a small slide show.